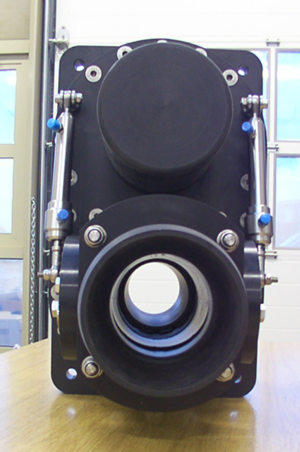 The new high performance ZJS100 dredge and jet pump for ROV use is now entering production. 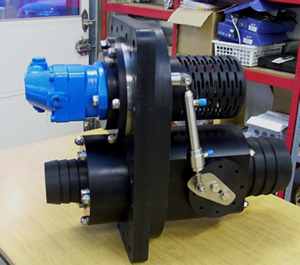 This is a 4" suction unit suitable for use on modern high powered work class ROVs. 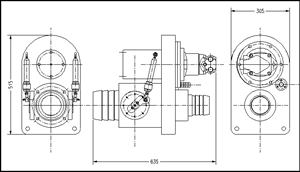 Provided the ROV can supply the power demand the 4" suction units have considerable advantages over the 3" units that have been used for many years. This unit can only be effectively operated by the most powerful work class ROVs. 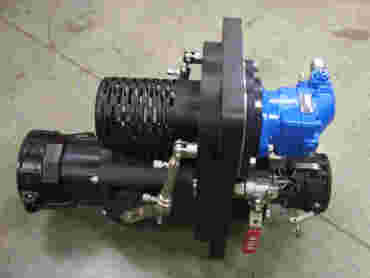 The unit benefits from the 30 years of experience built up from long before the design and build of the first ZIP89 Zip Pump twelve years ago. In particular a new impeller design created as part of the AZ20 Suction Anchor Pump development gives a wide dredging performance range both with and without the simultaneous jetting capability selected. The pump can be operated as a suction excavator dredging pump and use the disruptor jet nozzle at the same time. Part of the impeller design benefits from the pre-swirl inlet filter which also removes the need for a separate power water strainer. The arrangement minimises hose runs for installation on the ROV. Design History of the Dredge Pumps. The managing director of AMITS has personal experience of dredging going back over thirty years. That experience started as a diver using airlifts and the first of the diver held eductor pumps which in those days were powered by the ubiquitous Coventry Climax fire pumps. The experience continued with the design and build of a dredge unit powered by the hydraulic power pack of the Mobile Diving Unit on board the MSV Tharos. Continued involvement in drill cutting removal studies during the latter 1980s brought knowledge of all of the different types of dredge pumps systems available for deep water use. 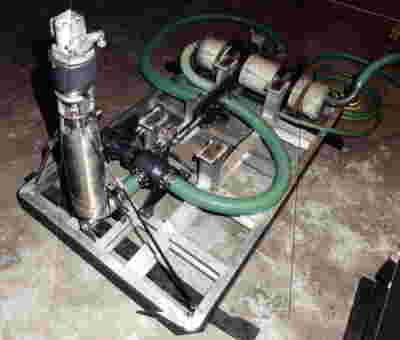 Before the creation of the first ZipPump the standard practice was to build up ROV dredge pump systems which were comprised of separate components brought together in a skid. A typical dredge system is shown below. This particular unit was designed and manufactured by Submarine Technology Ltd and supplied to Ametek. 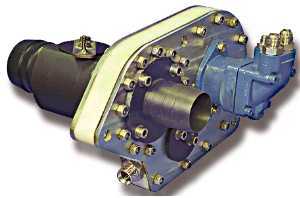 Other skid systems were created by Genflo and Circle Offshore. 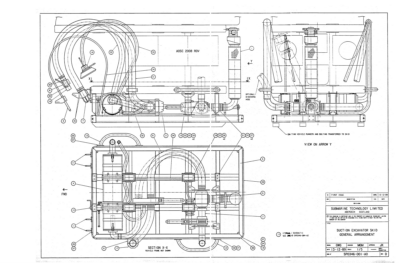 The Zip Pump which was conceived, designed and developed by R Q Martin of DeersHill Engineeering Ltd. and marketed by Tritech International Ltd. was a radical departure from the current practice and produced a lightweight unitised pump system. Compact unitised design has been the hallmark of R Q Martin for many years before Deershill and later AMITS. 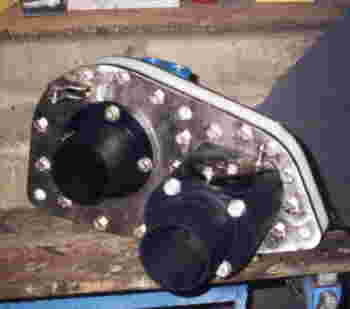 The prototype Zip Pump is shown to the right. The next Deershill development was the ZipJet which incorporated a water output port to allow jetting as well as suction operation. The ZipJet was configured for use on the WROVs typical of the mid 90s. With limited hydraulic input power available from the ROVs the unit had to provide a choice of either suction dredging or jet disruption. The ZipJet design was later further developed by Deershill Engineering Ltd to become the ZipJet Ultra.